This isn’t the first time I have exposed our public school system for seditious indoctrination of our kids, and it won’t be the last. One of the most dangerous developments of the last few decades has been the subversion of our universities by radicals who in the 1960s first tried to burn them down and then, after this strategy of destruction didn’t work, they decided to get on the tenure track to take them over. Their generational long march succeeded, possibly beyond their wildest expectations. 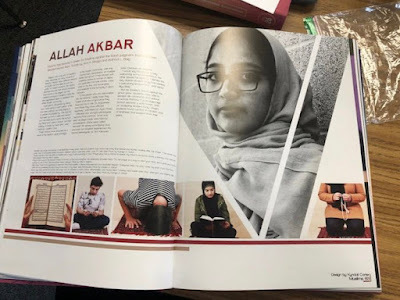 With the exception of a few rear guard actions by conservative student’s American higher education is now an indoctrination center for social Marxism, Islam, identity racism, and many other anti-American ideologies. But the left's DeepState demolition project is not yet complete. To make the victory complete, it must fully take over all’ of American education, including the minds of the students. This effort is now well advanced as Ed schools and the teachers unions as a base to extend their ideological campaigns into the K-12 system. Their shock troops include teachers, administrators, district leaders, textbook publishers and feature "theorists" such as Obama’s friend Weatherman terrorist Bill Ayers of Early Childhood Education at the University of Illinois who provide the manuals on "teaching for social justice" that target teacher training programs and ultimately children as early as kindergarten for radical hate America indoctrination. The effects of this systematic effort to radicalize K-12 education are being felt in school districts all over the country now. No corner of the classroom is immune from anti American indoctrination. Young students learning arithmetic are given thought problems involving homelessness and the percentage of "undocumented workers" subjected to heartless deportation proceedings. Illegal aliens are classified as immigrants and anyone opposed to illegal aliens are therefore classified as anti-immigration. Social studies is now a race, gender, and climate changed-obsessed curriculum designed to frighten rather than educate. In the hands of globalist’s teachers, America is a nation of victims rather than a nation of immigrants. Some concerned parents and educators appalled by this new regime have reported educational horror stories that should concern every citizen. The following gives a sense of the scope and intensity of the onslaught that our youngest and most vulnerable students face after the school bell has sounded. Indoctrination on Race and "Social Justice"
THE BOTTOM LINE: I must once again strongly advise the reader to ‘pull your kids out of public schools and universities’. Think about it for a moment…if everyone did that, the government and school districts would have to listen to the parents. But as it is, parents and children are at the mercy of the Anti-American globalist educators.